The carpet industry has succeeded in making carpet more sustainable and environmentally responsible than ever before. As almost all commercial carpet is certified as Green Label Plus, you can be sure that the carpet you select emits the very lowest VOCs possible. The GLP testing program meets or exceeds all regulatory requirements for emissions, including CA 01350, and is accredited by the American National Standards Institute (ANSI) to ISO Guide 65 specifications. Architects, designers and end users seeking environmentally preferred building materials can now identify carpet that has a reduced environmental impact through the ANSI/NSF 140 Sustainability Assessment for Carpet. NSF International has been developing public health standards and certification programs since 1944. ANSI/NSF 140 was the first multi-attribute ANSI-approved standard for environmentally preferred building materials.ANSI accreditation is a further assurance that the products tested and certified by CRI are green building products that meet high standards for indoor air quality. GLP-certified products, including carpet, are recognized by the US Green Building Council’s LEED version 4 standard as a Low-Emitting Materials Third Party Certification and can contribute one point to a building’s LEED score. Projects can also earn LEED credits by incorporating salvaged materials—such as refurbished, reused or recycled carpet—into plans for new construction or renovation. Recycled content carpet meets the same industry performance standards and carries the same manufacturer warranties as carpet without recycled content. 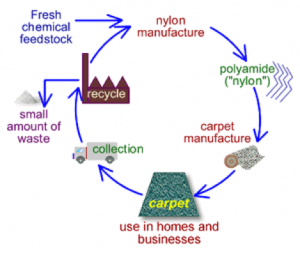 In addition, carpet manufacturers are voluntarily reducing the amount of old carpet that ends up in landfills. 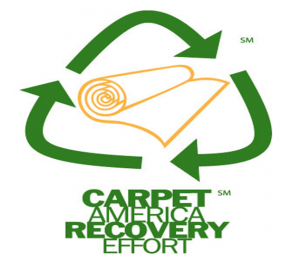 Through the Carpet America Recovery Effort (CARE), carpet companies, government entities and product suppliers are working to develop market-based solutions for the recycling and re-use of post-consumer carpet. Carpet materials are put back into carpet production or turned into things such as building materials and auto parts. The first in the flooring industry to study their products for indoor air quality effects in schools and commercial settings was the carpet manufacturers. Evaluated was carpet’s role in the indoor environment what resulted was the Green Label and the Green Label Plus programs. These programs tested and certified low emissions from carpet, cushion and adhesives. Green Label Plus is an example of CRI’s leadership in the best practices of environmental responsibility. Look for the CRI Green Label Plus logo as proof that the product has been tested and certified by an independent laboratory and has met stringent criteria for low emissions. Air Quality Sciences, an independent laboratory, tests carpet and adhesive samples using the most up-to-date, dynamic environmental chamber technology. The test methodology was developed in cooperation with the U.S. EPA and has been adopted by the American Society for Testing and Materials (ASTM) as D5116 – Standard Guide for Small-Scale Environmental Chamber Determinations of Organic Emissions from Indoor Materials/Products. Addressing the challenges of post-consumer recycling, CRI has a committee of member representatives rallying industry expertise and resources. Included in the committee’s work is the developing of an identification system of carpet materials to make the sorting of fiber and backing compounds easier and more efficient in the future. Many CRI member companies as well as many entrepreneurs around the country are currently using this identification system, called the Carpet Component Identification Code (CCIC).